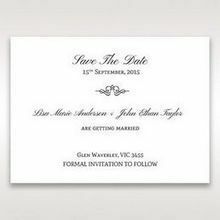 This lovely ivory invitation is perfect for the romantic garden wedding. 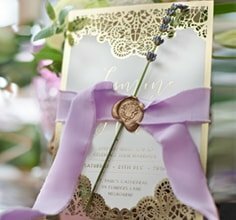 Designed using the latest in embossing and silk screening techniques it has been finished with a perfectly placed ribbon to complete the look. 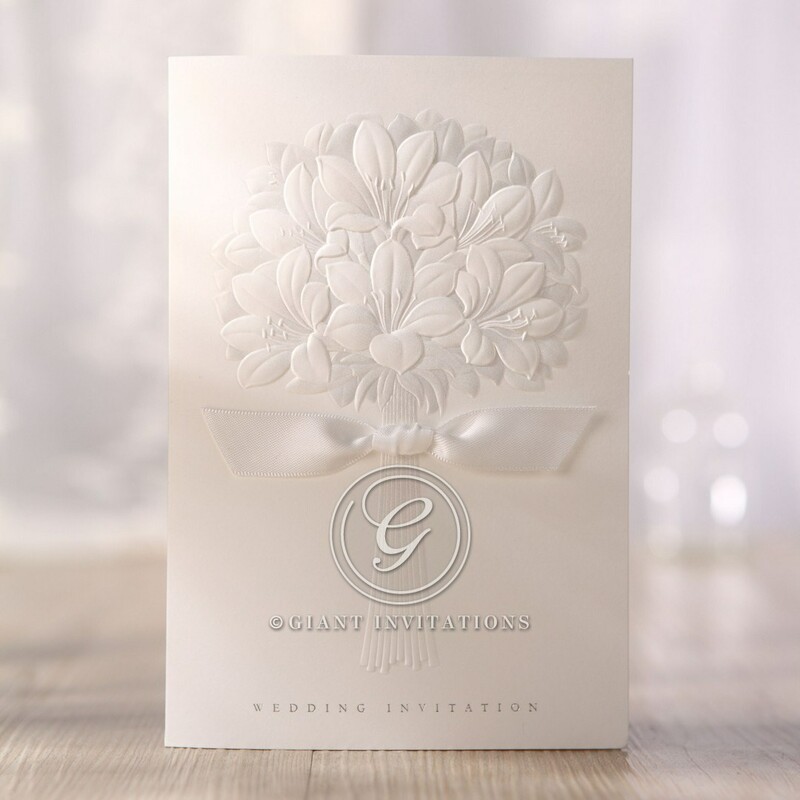 Add to that the silver foil stamping on smooth pearl paper, and you have a delicate yet attractive invitation for your wedding. 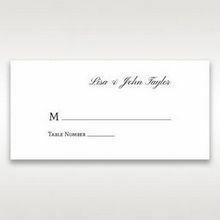 We are unable to change the words ‘Wedding Invitation’ present on the front of this invite but you can order the stationery suite that contains RSVP cards, Wishing Well cards, Reception Cards, and more. 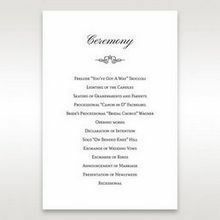 Made available from Giant invitations. 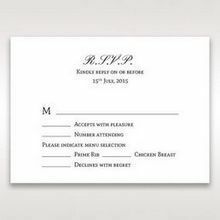 The wedding invitations complete with rsvp cards were beautiful. All of our guests commented on how elegant and professional they were. 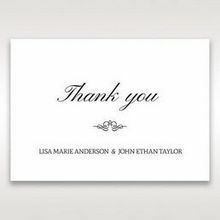 Thank you for providing such a great service and quick turn around on production. 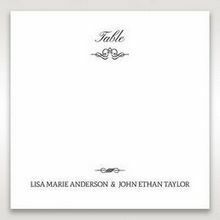 love this simple but elegant design.we have bought three sample invitations but decided to go ahead this beautiful and elegant design.! 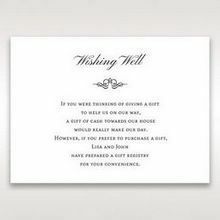 We absolutely love the invites and have had so many compliments from our friends and family since we sent them out. Also the customer service throughout the whole process has been fantastic; friendly, efficient and with amazing attention to detail . I LOVED THE SAMPLES!!!!! They were very beautifully done and my beau and I loved all of them. The arrival time could not be beat either. Very impressed! 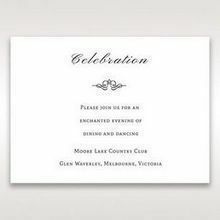 The invitations are absolutely beautiful we are so happy with them - they are exactly what we asked for and turned out so beautifully. Thank you for your great communication and prompt delivery! Our orders are better than what we expected. We will give 5 stars for quality. We really appreciate the proofing before sending out the final product. 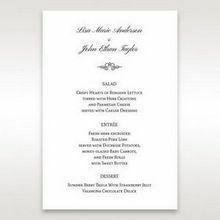 Brilliant website, I found the whole process of creating my invitations and then ordering them extremely simple especially with the help of your online chat!